Dr. Hannes Vogel, director of neuropathology at Stanford University Medical Center, guides Anna Park, a second-year pathology resident at the Stanford School of Medicine, as she makes incisions while conducting a brain autopsy at the neuropathology forensics lab on Jan. 15, 2019. Photo by Veronica Weber. A pathology resident holds a human brain before beginning an autopsy. Photo by Veronica Weber. Editor's note: This story contains images of brains that some readers may find discomforting. On a cool afternoon in December 2017 at Stanford University Medical Center, neuropathologist Dr. Hannes Vogel found himself face to face with the gunshot-torn brain of a killer. Vogel readied the brain for an autopsy, placing it in a bucket filled with formalin, a preservative to help keep its soft tissues from falling apart. The mysterious brain belonged to Stephen Paddock, the notorious Las Vegas shooter. Just weeks before, on Oct. 1, Paddock had unleashed 10 minutes of terror and violence at a music festival from his 32nd-floor sniper's perch in the Mandalay Bay Hotel. He killed 58 people and injured at least 400 by gunfire, according to public officials. Vogel is a renowned expert in neuropathology, a branch of medicine concerned with diagnosing diseases of the nervous system, often through study of tissues of the body. In the world of pathologists, his is a rarefied subset. But he's also an expert in forensics, a field in which scientific techniques are used to detect crime — making his skillset all the more unusual. After weeks of police investigation, authorities still had a nagging question: Why had Paddock unleashed such violence? With a motive still unclear, officials from the Clark County Coroner/Medical Examiner's office in Las Vegas, Nevada, turned to Vogel to uncover any secrets within Paddock's brain. Although remote, it was possible that Paddock was afflicted with an infection, tumor, toxin or neurodegenerative disease, such as frontotemporal lobar degeneration, which creates a loss of inhibition. The latter is the most common form of dementia in people under age 60, Vogel said. Las Vegas authorities were determined not to rule anything out in their quest for the truth. "Don't spare any effort," Vogel recalled the Clark County coroner said. Surprisingly large to the untrained eye, the average adult male brain weighs about three pounds and is about 5.5 inches wide and 6.5 inches long. Vogel placed the brain on a stainless steel table fitted with specialized cutting boards. The killer's brain had significant damage near the back, the result of a self-inflicted, fatal gunshot, Vogel said. He gently pressed its surface looking for soft areas, evidence of edema, or tissue swelling, and for tumors that can't be seen but might be felt. He looked for signs of blood clots and visible deformities and for evidence of brain shrinkage, such as large spaces between the convolutions or lobes. Such shrinkage could indicate dementia. Some forms cause violent outbursts, paranoia or hallucinations. Vogel lifted an 18-inch-long knife, deftly cutting Paddock's brain in half-inch-thick slices. 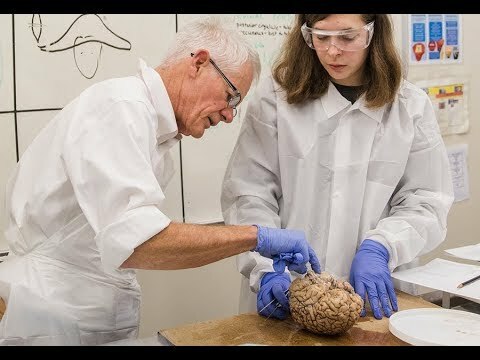 He removed samples in accordance with procedures written on the white board behind him: frontal watershed; hippocampus; occipital; midbrain; pons; medulla; cerebellum; spinal cord; and in adults only: posterior cingulate and precuneus. He laid the pinkish slices out in succession, gently feeling and probing each for abnormalities. If Paddock were an alcoholic, the cerebellum would likely have shown areas of atrophy. The normally smooth vermis, an area of the cerebellum that affects balance, would have been shriveled. Vogel did not find any outward signs of afflictions, he said. Methodically, he took small samples from each area of the brain and placed them individually in silver-dollar-sized, perforated, plastic containers. Over the next three weeks, Vogel would keep returning to these samples, which he cut into tissue-paper-thin slices and affixed to glass slides. He dipped the slides in a series of chemical solutions, a laborious process, at precise concentrations and intervals to prepare them to receive the hematoxylin, a natural dye, and later, the eosin stain. Called H&E, these two combined are his "workhorse stain," the one that will inform his future decisions toward other stains as he teases out clues to solve the mystery. The tissues turned color — in this case, a pinkish hue — revealing patterns only visible under magnification. Vogel pushed the slide under a microscope. He was about to get the first glimpse into the hidden story of Paddock's brain. This is the part of the science of neuropathology that most excites him. As a 6-year-old child in west Texas, he would look into his physician mother's microscope, fascinated by the hidden world he saw through the lens: the microscopic hairs and cells of leaves and other bits of nature that he would find outdoors, he said. Later, as the chief pediatric resident at San Francisco General Hospital, he would trade the stethoscope for the microscope. Vogel had discovered what he called his "visual side." He found he has an excellent eye for discerning the odd shapes of cells, clusters of cancers, plaques of Alzheimer's disease and many telltale clues that differentiate diseases and conditions. "Looking down the microscope, the tissue was a thrilling thing for me. I think I found a greater promise for a lifelong career," he said. Vogel studied three years of anatomic pathology in a residency program at Harvard College. At Beth Israel Hospital in Boston, he honed his interest in neuropathology. "I fell under the spell of the nervous system. There's just something about the miracle of the nervous system," he said of its ability to control movement, behavior, all of the senses. Even more incredibly, it is the abode of consciousness. He returned to the Bay Area for two years on a neuropathology fellowship at Stanford University in the late 1980s. He then went to work for Texas Children's Hospital for 10 years, where he became the director of neuropathology. When the neuropathology directorship opened at Stanford in 2002, he jumped at the chance. It was his dream job, he said. Vogel comes from generations of doctors on both sides of his family. His paternal grandfather was among the Czar's retinue of physicians in pre-revolutionary Russia; his maternal grandfather and great-grandfather treated patients in the Appalachia mountains of rural Kentucky, often traveling by mule in the mountains. Their arsenal included their knowledge, wits and just three medications: aspirin, phenobarbital and morphine, he said. His mother was a pioneer in maternal and child health, migrant women's health and wrote the first funded WIC grant. Little could they have imagined that their descendant would one day have all manner of diagnostic chemicals, stains and technologies to discern microscopic anomalies. Over his career, Vogel has published hundreds of research papers on tumors, muscle diseases, hemorrhages in the brain, congenital disorders, pediatric cancers and the effects of tumor-producing hormones. His book, "Nervous System," is part of the Cambridge Illustrated Surgical Pathology series and is considered the most comprehensive text of methods utilized by pathologists to diagnose diseases affecting the brain, meninges and spinal cord. Two to four brains arrive each week to the Stanford Hospital Morgue where Vogel works. Many come from coroners in Las Vegas and California's Central Valley. In the past five years, Vogel's lab has received 129 brains from Clark County alone. The lab currently receives about 20 to 30 brains per year, he said. Other brains come from patients or families of patients at Stanford or Lucile Packard Children's hospitals who have given permission for either limited or full autopsies. Some are donations to science; others reflect a desire to understand murkier causes of death. Most brains are not related to crimes, but of those that are, the findings are divided into four conclusions: natural and accidental deaths, suicide and homicide. As intriguing as an aberrant death might be to readers of crime novels, in reality, most causes turn out to be natural, Vogel said. Vogel's first forensic case, in Texas, was a shaken-baby death. Over the years, he has seen a number of such homicides, in which the tiny spinal cords show nerve-ending tears near the base of the brain. Such a discovery is "a very emotional one for anyone," he said. In pediatric cases, hemorrhaging and injury patterns in the brain have helped him identify abuse or blunt-force trauma that was inflicted. He conveys his findings in a report to the referring coroner or party. The report — or even his testimony — might come before a grand jury or be admitted at a trial. At times, he's been subpoenaed as an expert witness. "I have a very strong conviction that if I can bring my academic credentials to bear in the criminal justice system, I'm going to do that. Ideally, you offer an accurate and objective diagnosis and let the legal system pursue its objectives," he said. Vogel does not only detect crime; there also has been exoneration. The Las Vegas coroner wanted to rule out homicide after learning a deceased, elderly man had feared someone wanted to kill him. Vogel discovered that the man had Lewy body dementia, which often causes hallucinations and paranoid ideation — a more likely occurrence than homicide. In one particularly poignant case, an 18-month-old boy was found dead in a bed the morning after his parents had left him with his grandmother so they could enjoy an evening out. The question surrounding the baby's death: Had the grandmother accidentally smothered him after turning over in her sleep? Vogel's meticulous sleuthing uncovered the more probable cause of death. "I found a malformation in the hippocampus," he said. The baby had had a seizure caused by the underlying condition and died because of it. Though the parents were devastated because they had lost their child, his finding indicated the condition would very likely not develop in future children they might have. Pathologists are often seen as socially impaired, distant types, Vogel said. "But I'm very sensitive in all of these situations. Each brain has a story behind it," he said. During his quest to uncover the story behind the Las Vegas shootings, Vogel's early stained samples of Paddock's brain made cell nuclei appear purple, giving Vogel a better view into any possible abnormalities. Vogel found some atherosclerosis, a buildup of fats, cholesterol and other substances in artery walls, which can restrict blood flow. Paddock's brain wasn't any more atherosclerotic than the average 64-year-old American male, though. Vogel let that information guide him to the next set of stains, which led to others. He teased out myelin material, which allows for normal conductivity of electrical impulses. He looked for evidence of neurodegeneration such as Alzheimer's disease. Paddock showed no evidence of any neurodegenerative disorder and no toxic nor blood vessel diseases, Vogel said. But he did have an abundance of microscopic bodies called corpora amylacea, which come from degenerated cells or thickened secretions. They appear as grayish-purple little balls, Vogel said, about twice the size in diameter of a white blood cell — 24 to 34 micrometers or 0.000936-0.001326 inch. Scientists aren't sure why they form or what their function is. "There are those who say they are the wastebaskets of the brain," Vogel said. Paddock had a large number of corpora amylacea in areas of the brain where they are typically found: near the base of the brain and in the hippocampus, which is responsible for emotions such as fear and anger. "He had an unusual number — to the extent that I showed it to another neuropathology expert in our department. He took one look at it, shrugged his shoulders and said, 'I don't know. We see this,'" Vogel recalled. Even with large numbers of corpora amylacea, a link to degenerative brain diseases that cause violent behavior is hard to substantiate, he added. At the very least, it would require research that extended far beyond one individual case. In the end, all of Vogel's sophisticated forensic tests, his years of experience and his intuition could not shed light on what led Paddock to commit his terrorist act. Absent any clear underlying neurological clues, Vogel was left with one sad conclusion. "This individual, we're all sorry to say, was cruelly calculating," he said. Vogel's assessment was born out by the FBI. The agency's Behavioral Analysis Unit shared its findings from a yearlong investigation in November 2018 with the Las Vegas Metropolitan Police Department and released a summary report to the public on Tuesday, Jan. 29. The report concluded there was no evidence that Paddock's attack was based on any ideological or political agenda and was not based on revenge toward any known individual, business or group. Paddock shared many of the same traits as other mass-shooters, according to the FBI. Paddock had become increasingly distressed and intolerant of "stimuli" while simultaneously failing to handle common life stressors linked to aging. He experienced "an objective (and subjective) decline in physical and mental health, level of functioning and financial status over the last several years of his life," the report noted. He decided to control the ending of his life by suicide and saw his actions as a way to attain infamy, the report noted. I've read somewhere that many sociopaths have unusual shaped heads which probably indicates an unusual shaped brain and/or unusual personality. Many also have unusual facial expressions as well. Based on these cited scientific observations, many crimes could probably be prevented by profiling such abnormalities and subjecting certain individuals for further testing. It should all be voluntary of course as we do not wish to be operating a police state. On the other hand, some individuals should not be allowed to walk the streets as many could be walking time bombs based on their brain chemistry and shape. How young are you? Suggestion - start with a history book or two before the pseudo-science. Maybe 1930's Germany, though there is plenty to study from the 1800's, including our very own slavery apologists in the traitorous confederate states. Craniometry involves the study of head shapes and their relation to criminal types. Both sciences have been called into question at times due to their pinpointing of certain ethnicities. Both sciences have been called into question .. due to their .. lack of evidence. Posted by Sieg Heil, Baby! So it's skull shape that determines a propensity for criminal activity...? Like football related head injuries, the actual underlying factors to certain forms of destructive self and societal behavior only become clearer with post-mortem analysis. Kudos to Dr. Vogel for attempting to get to the bottom of this mystery. On the other hand, some individuals are born with cranial and/or brain imperfections that lead to anti-social behavior. These are the ones that need to be weeded out...not necessarily incarcerated or institutionalized but keeping a watchful eye on. "In the end, all of Vogel's sophisticated forensic tests, his years of experience and his intuition could not shed light on what led Paddock to commit his terrorist act. What a waste of time...nothing accomplished or conclusive. Interesting and well written article, Sue. Comment section, not so much. "What a waste of time...nothing accomplished or conclusive." Not so, for at least a couple of reasons. First, the investigation ruled out a large class of possible reasons for Paddock's extreme behavior, which was what the request was all about. So, something conclusive was accomplished, though not to everyone's personal desires. Second, small pieces of information, not yet fully understood given the limited sample (of 1), which will be of use to further research were uncovered. Again, something accomplished, though of low dramatic value to those outside that fascinating research arena. And one more thing: Sue Dremann is a gem - excellent work. "Like football related head injuries, the actual underlying factors to certain forms of destructive self and societal behavior only become clearer with post-mortem analysis." ... No. For example, brain scans and existing autopsies together can give good indications of the relation between indicators (decision processes, unusual or eccentric behavior) and extreme destructive actions. Post-mortem analysis is a critical, but not the only, means of making it clearer. "On the other hand, some individuals are born with cranial and/or brain imperfections that lead to anti-social behavior. These are the ones that need to be weeded out...not necessarily incarcerated or institutionalized but keeping a watchful eye on." ... How? Why? By whom? No, but in all likelihood, anyone having been diagnosed with such "imperfections" will be under the "watchful eye" of professionals. If not, we are denying the "equal protection under the law" of those people as well as those fearful of them. I don't pay too much attention to head shapes and/or correlate them with any particular type of behavior BUT, I have noticed that people whose eyes are noticeably close together tend to be weird, irritating individuals regardless of their gender. C'mon, Those Eyes, my eyes are NOT too close together, nor am I irritating and -- OK, maybe a little weird. However, I think I'll start a register of all Bay Area persons with eye placement fetishes - you know - just in case. Brain tumors etc. as cause of mass shootings? Are those with brain tumors typically about 95% male and only 5% female? Are those with brain abnormalities or declining "inhibition" or mental diseases generally about 95% male and only about 5% female? Clearly not. The FBI stats referenced in this article show that by far the best demographic 'predictor' of being a mass-shooter is male gender i.e. about 96% are males. Declining "inhibition" as a result of brain deterioration apparently does not lead as many females to act out as mass shooters (as opposed to other types of uninhibited behaviors). Instead of spending so much time and money looking for tumors or other brain abnormalities in the very violent, how about more time and money addressing the socialization behind so many males' very violent behavior. > Brain tumors etc. as cause of mass shootings? Are those with brain tumors typically about 95% male and only 5% female? Are those with brain abnormalities or declining "inhibition" or mental diseases generally about 95% male and only about 5% female? Clearly not. > how about more time and money addressing the socialization behind so many males' very violent behavior. Good points, This doctor is full of horse feathers. Unbridled testosterone levels & anger management issues are also responsible for these mass shootings.